• Speak to the venue coordinator to see if there is another small room that you can hire for the day so that you can use it for entertaining the children. Obviously this will have to be incorporated to your budget but you may find that the venue will offer you a very reasonable rate or they may even allow you to use this room for free if it is going to be empty on the day. • If you do have a spare room for the children then you may want to consider taking a television and DVD player or games console so that the children will be able to sit in there and be entertained. • If the children are particularly young, then you could hire a children’s entertainer such as a magician or clown or even a face painter. • Take some other games along such as board games and speak to the children’s parents about them bringing along some of their own favorite toys to play with. 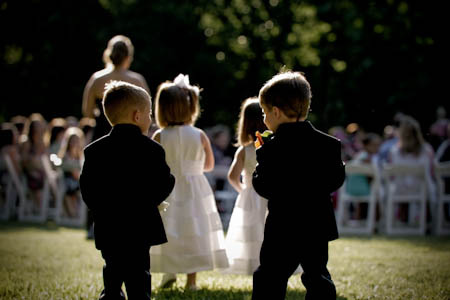 • It would be a good idea to pay a couple of teenagers to sit with the children if there will be any at the wedding. If not, then you could do up a rota so that each of the children’s parents will take turns to sit with them. • Goodie bags are a great idea for children at a wedding. There are so many little items that you can put in such as candy and coloring pens.